BROADWAY DANNY ROSE starts off with one of the best opening sequences I’ve ever seen in a movie. A gang of old school, Borscht Belt comedians (real life comedians such as Sandy Baron and Jackie Gayle playing themselves) are hanging out at The Carnegie Deli just kickin’ the Willie Bobo, telling stories, drinking coffee and having laughs. They’re entertaining each other with outrageous stories about various actors, agents, comedians and club owners they know when the conversation turns to the legendary Broadway Danny Rose (Woody Allen) who after failing at his own stand-up comedy career becomes an agent. But not just any agent, mind you. Danny specializes in the acts that nobody wants, like the one-legged tap dancer and the blind xylophone player. And then Sandy Baron tells the other guys to sit back and get comfortable because he’s going to tell them The Greatest Danny Rose Story. This is the one with Lou Canova (Nick Apollo Forte) and Tina Vitale (Mia Farrow) You get the feeling that these guys have heard this story many times before but it’s so funny, so outrageous and so downright goofy they don’t mind hearing it again. And with good reason. It’s a great story. Lou Canova is a has been lounge singer with an ego the size of an earthquake who made some noise with a hit called ‘Agita’ back in the 50’s and now, in the 80’s, there’s a big nostalgia boom that he’s riding. Danny gives him a lot of personal attention because Lou is his most successful act and he’s come to the attention of Milton Berle who wants Lou for a television special. If the special goes over big then he’ll hire Lou for his opening act in Las Vegas. Danny books Lou for a show at The Waldorf where Milton Berle will come check him out. It’s the biggest night in the lives of both Lou and Danny, especially for Danny who has essentially brought Lou from obscurity to the brink of stardom. Lou likes to pull a cork and that’s more than enough to keep Danny up nights trying to keep Lou sober enough to make the gig. The situation is complicated when Lou asks Danny to bring his girlfriend Tina to the show. This is a bad idea, Danny says. What about Lou’s wife? She’s going to be there. Lou insists that Danny can be the beard and pretend to be Tina’s boyfriend. He just wants her there. Then Lou and Tina have a major fight and she tells Lou to go to hell. She also goes back to her old boyfriend and Danny is forced to follow her to Long Island where he finds out to his dismay that the ex-boyfriend is a member of a Mafia family and there’s a series of events that end up with Danny going on the run with Tina as the ex-boyfriend has brothers with baseball bats and tire irons they’re eager to use on Danny. Danny’s got to try and dodge the crazy Rispoli brothers as well as keep Lou sober to get him to the show. All this while fighting with the tough-as-nails Tina who finds herself having strange feelings she’s never had before and it takes her a long time before she realizes that Danny is the reason she’s having these feelings. I’ve been a Woody Allen fan for a long time. “Sleeper” and “Love And Death” are two of the funniest movies I’ve ever seen and “Manhattan Murder Mystery” is an excellent blend of mystery and comedy that evokes the feeling of the classic “Thin Man” movies. “Shadows And Fog” is like if Fritz Lang and Kafka collaborated while on crack. 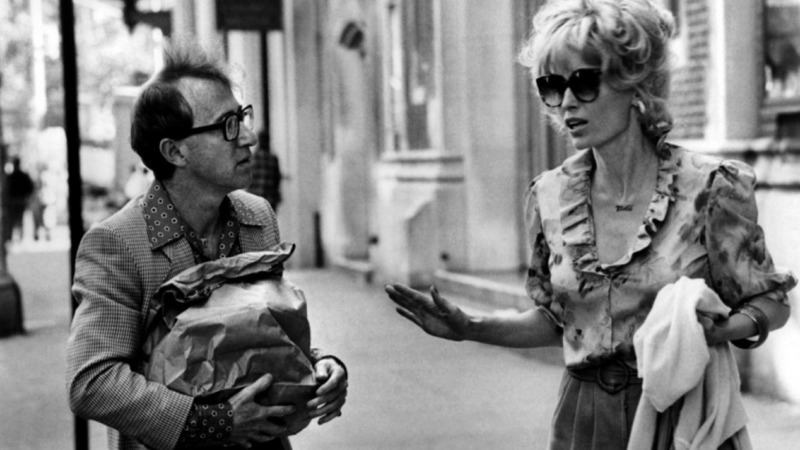 Woody Allen proved long ago that he’s one of the most entertaining filmmakers of our time. His movies are always interesting to watch and occasionally very funny if not downright hilarious. In BROADWAY DANNY ROSE the humor comes right from the characters and the bizarre situations they find themselves in and the story gets increasingly more complicated and funnier as Danny hyperactively tries to make everything come out right and just get his client the stardom Danny honestly believes he deserves. Woody Allen plays the same character here he plays in all his movies: the nerdy, neurotic intellectual who talks faster than a used car salesman and is desperately trying to convince everybody he’s on top on things. I once watched an interview with Woody Allen who revealed that in all his movies he’s doing Bob Hope and I can see it. The rapid one-liners thrown off in a seemingly careless manner, the coward who is forced to rise to the occasion and be heroic, the insecure little kid with a huge ego who thinks he’s the world’s greatest ladies man, it’s all there and Woody plays it to perfection in this one. Mia Farrow is the real acting surprise in this movie. Who knew she could play a loud-mouthed, ill-mannered cheap blonde so well and so hilariously? Nick Apollo Forte apparently plays a character that is a lot like him and mirrors his actual career in Real Life. He has a couple of scenes in this movie that are really nice and you get to like this big stupid lug whose talent is nowhere near as big as his head but he’s so likeable you can even forgive the dirty trick he pulls on Danny near the end of the movie. So should you see BROADWAY DANNY ROSE? Yes. If you’re a Woody Allen fan you’ve probably seen it already so I don’t have to convince you. But maybe you’ve never seen this one and only checked out Woody’s earlier movies where he depended more on physical comedy. 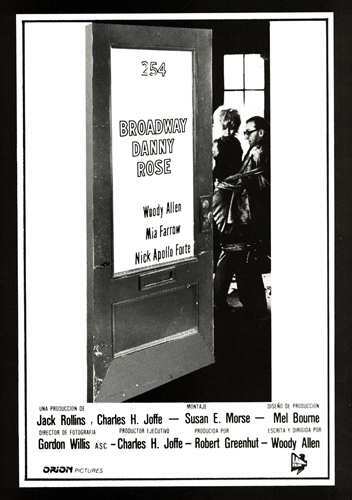 BROADWAY DANNY ROSE is an excellent comedy built on a bedrock sound foundation of wonderfully eccentric, quirky characters and a solid, entertaining story. Definitely worth a look on Netflix or if you get Turner Classic Movies via your cable/satellite provider wait for it to show up there.